Mitsubishi Electric creates the highest quality air conditioners and air conditioning products for the home, industry and business. It doesn’t matter where you see a Mitsubishi product you will notice the same hallmarks of dependability and performance. With Mitsubishi Electric, it’s all about quality of life. Mitsubishi air conditioners are world-leaders in quietness, reliability and energy efficiency, and have a proven performance record in the harsh Australian environment. Whether heating or cooling your space H&H Air Conditioning will install your Mitsubishi Electric air conditioner to maximise its potential. If you’re searching online for ‘Mitsubishi Air Conditioners Brisbane‘, ‘Mitsubishi Electric Brisbane‘ or ‘Mitsubishi Air Conditioning Service Brisbane‘, the team at H&H Air Conditioning has everything you need. Call us today on (07) 3276 1800, so we can answer any questions you may have. 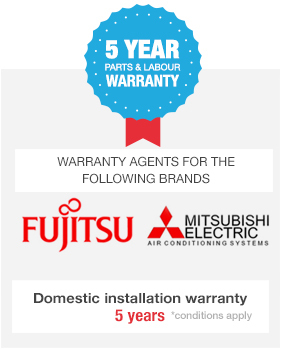 Since 1967 Mitsubishi Electric have been producing high end electronics establishing their reputation in Australasia for quality from the very start. With a huge range of split systems, multi split systems and ducted air conditioners in the Mitsubishi Electric Brisbane range our H&H Air Conditioning technicians will be able to advise you what will best suit you and your environment from home applications to large scale commercial systems. H&H Air Conditioning have a long history with Mitsubishi using their air conditioners from the very beginning. Having this long term dealing with them means our relationship with Mitsubishi gives us not only a great understanding of the product and how to truly get the most from it but we can also work to get the best in prices and new components. Something we can pass that directly on to you our customers. H&H Air Conditioning is an authorised dealer and servicing agent for Mitsubishi Electric Air Conditioners in Brisbane and South East Queensland. The H&H Air Conditioning Service Brisbane team has a massive amount of experience helping commercial and domestic customer with regular scheduled maintenance and emergency repairs. If you need Mitsubishi air conditioning service Brisbane wide, look no further then H&H Air Conditioning. For all your Mitsubishi Electric Air Conditioning Brisbane needs, H&H Air Conditioning has you covered. Call today on (07) 3276 1800 or complete our online form.